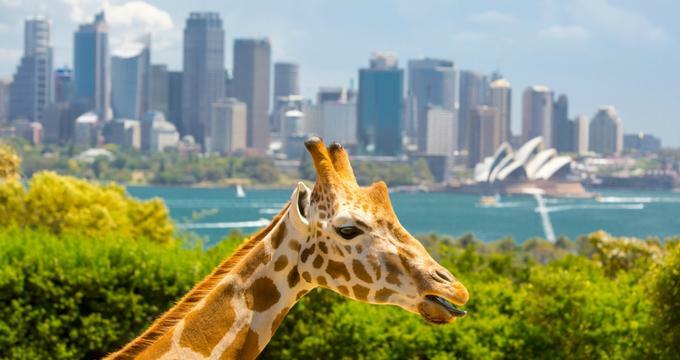 The Taronga Zoo, in beautiful Sydney, Australia, is an educational and fun immersive zoo experience in the middle of the city. See the over 4,000 different animals, some up close and personal, and spend the day learning about wildlife of all types. The Taronga Zoo has been open since October of 1916. The zoo itself is divided into eight different zoogeographic areas to feature animals specific to each environment, and it occupies almost 70 acres of land. The zoo current features more than 350 different species of animals, with a focus on preservation and conservation. It was the second zoo in the country to successfully breed a platypus, as well as facilitating the first elephant birth in Australia. Taronga means “beautiful zoo” in the aboriginal language. The Taronga Zoo is open from 9:30am to 4:30pm from May through April, from 9:30am to 5:00pm from September through April, and from 9:30am to 4:00pm on New Year’s Eve. It is open every day of the year, even on Christmas! Tickets can be purchased at the gate or online for a 20% discount. Adults pay full price with a discounted admission cost for children. Children under the age of 4 are free. Annual passes are also available for guests and families who intend to visit the zoo frequently. The zoo features over 4,000 animals in different enclosures, as well as keeper talks, animal encounters, tours, and shows. · Keeper talks- These talks are done throughout the day in different areas of the zoo. A full daily schedule is maintained on the website, including the location of each talk and what time it will be given. There is also an app that can be downloaded so that information can be accessed digitally while at the zoo. · Animal Encounters- Get up close and personal with some of the coolest animals living in the zoo! Meet a koala, hold an owl, or even feed the giraffes! Each encounter comes with a photo to commemorate the experience. · Tours- For visitors who are interested in getting behind the scenes at the zoo, Taronga offers tours led by experienced tour guides. There are a few different choices depending on the area of the zoo, cost, and time required. Choose from the “Wild” Australian experience, the “Gold” tour, the Aboriginal tour, the Walkabout tour, or the hospital tour. Comprehensive information about all available tours can be accessed on the zoo website, including when they are offered, and cost required. Reservations can be made in person at the zoo. · Shows- Located in the Centenary Theater, the zoo features a variety of wildlife and zoo related films and shows for visitors to sit down and enjoy, especially on the hot days! This huge, immersive screen experience (the first of which was the Wild Squad movie - an adventure movie about a young female child who learns about a hidden area under the zoo and goes on an exploring mission) is great for the whole family! Shows last just over 10 minutes and are offered free of charge. Each year, over 150,000 students visit to zoo on field trips and other educational experiences. The zoo offers educator planned and curriculum-based field trips and programs, which run based on project style learning and interactive experiences. With a variety of workshops, tours, and guided walks that vary depending on the grade level of the class, students will enjoy a day full of out of the classroom learning that is catered to the way that children learn best. Reservations can be made online or by calling the education team at the zoo directly to schedule or ask additional questions. For classrooms that can’t make the trip to the zoo, Taronga can bring the zoo to the classroom with their very own zoomobile, meant to allow similar educational experiences in a structured classroom environment. Some of the animals may even travel! Contact the educators for additional information about how to schedule a zoomobile visit. Passes can be purchased that allow guests unlimited access to the concessions located at the zoo - they can be bought either at the gate or online (at a 20% discount). There are also a few choices for restaurants while visiting the zoo, like The View and Forage & Graze - each with their own spin and offerings. For guests who want to do a little shopping during their visit, check out one of the zoo’s gift shops and take home a stuffed animal, apparel, toy, or even pick up sunscreen if it got forgotten at home!